Agra is perhaps one of India’s most densely populated cities, not only in terms of people but also with regards to its vehicular population. Two-wheelers are the most popular mode of transport in the city, with all two-wheelers expected to mandatorily have insurance. The city witnesses accidents involving two-wheelers on a daily basis, with these often resulting in loss of life. A good two-wheeler insurance policy can help one during such accidents, limiting the financial burden associated with them. Agra is one of the most popular cities in India, with it considered a hub of travel and tourism. As such, a number of outsiders can be found exploring the city and its surroundings in two-wheelers. Insurance companies have realised the importance of Agra for their business, with almost all major general insurance companies offering two-wheeler insurance in the city. Note that the names listed above are not ranked in any specific order. They are just some of the popular insurance companies which offer bike insurance in Agra. The concept of cashless garages has become popular across the country, with insurance companies aiming to tie up with as many garages as they can. This tie-up not only helps customers when it comes to getting damaged bikes fixed, it also helps companies increase their customer base. A cashless garage can be a blessing after an accident, for one might not be in the right frame of mind to search for a service centre to fix the damage. These garages offer services which can be availed without hassle. Finding the nearest cashless garage in Agra is simple, with insurers providing a number of different ways in which these garages can be located. The customer care number of the insurer can be contacted to find the location of all network garages in Agra. These customer care numbers, however, might not be functional 24/7. Almost all insurance companies have an online presence, wherein they provide an option of locating network garages through the ‘Garage Locator’ tab. One simply needs to enter the area they wish to search in, with the locator displaying all network garages in that area. Individuals can contact the insurance agent who sold them the policy and ask him/her about the network garages. One can also use the mobile app of the insurance company to find a network garage. Certain sales brochures might contain a list of all network garages in the area. Utilising the services of a network garage can be beneficial in a number of ways. Efficient – The entire process of getting a damaged vehicle fixed at a network garage is simple and efficient. There is minimal paperwork required, with representatives of the insurance company assisting the policyholder at each step. Quick – Most network garages are able to service and fix damaged vehicles quicker than regular garages. This is primarily because of the tie-up they have with the insurer. This ensures that one can get on with their regular way of life without having to make alternate arrangements. Quality service – One can be rest assured that the quality of service is top notch at network garages. The spare parts used are bound to be original, eliminating the thought of using a vehicle with fake spares. Normal garages are known to use duplicate/used spare parts, which can lead to further complications in the future. Cheaper – The out-of-pocket spending is reduced when a vehicle is fixed at a network garage. The insurance company directly settles the bill with the garage. Payment might be required only in cases where the bill amount exceeds the cover limit. Replacement vehicle – Certain network garages could offer a replacement vehicle until they fix the damaged bike. This could vary from insurer to insurer. Expertise – Most network garages hire expert technicians and mechanics who are well versed with fixing damages. This can be a boon in case of rare or expensive bikes, which require expert care. Additional services – Some network garages are known to offer additional services like towing, home pickup and drop of vehicle, etc. A good insurance policy not only provides protection to the vehicle, but also removes the stress associated with riding on Indian roads. While most of us purchase a two-wheeler insurance to meet government regulations, there are a few points which should be considered before buying it. 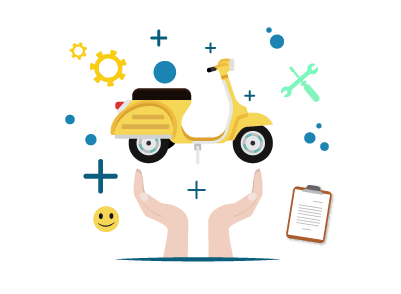 Term of the policy – Two-wheeler insurance policies typically come with a term which ranges between a minimum of 1 year to a maximum of 3 years. One should choose a term which suits their need. A longer term can remove the hassle of yearly renewal, in addition to offering a better deal on the premium. Cover provided by the policy – Check whether you need a comprehensive cover or just the basic third-party liability cover. A comprehensive cover is a better option for our roads, given the number of accidents which occur each day. Claim settlement process – Choose an insurance company with a good claim settlement process. There is no point choosing an insurer who is unable to settle a claim, reducing the worth of the policy. Check whether there is a dedicated claims settlement team before purchasing the policy. Premium – Make sure that the premium amount is affordable. Typically a third-party liability cover is cheaper than comprehensive cover. A number of factors go into determining the premium amount, with the key ones being the model of the bike, age of vehicle, city of registration, engine capacity, etc. Service – Choose an insurance company which offers additional services. With competition increasing, it is not hard to find a smarter deal with respect to services on offer. Network garages – Make sure that your insurance company has network garages across the country, with a good number of these garages located in the city where the vehicle is used. Discounts – Compare different insurance companies to avail discounts. Purchasing a policy online can be cheaper than purchasing it through an agent. The sale of used bikes is extremely popular in India, with thousands of them sold each day. While buying such bikes, one should remember to transfer the insurance policy in their name, for failure to do this is sufficient ground for insurers to deny any claim in the future. Transferring an insurance policy is simple and can be done by following a few basic steps. Inform the insurance company once the bike has been sold. This should be done by the seller. In case the seller fails to do so it is the duty of the buyer to ensure that the insurance company in intimated. Provide documents pertaining to the sale of the vehicle to the insurer. These documents include the sale deed, NOC, bike registration certificate, etc. Ask the insurance company to transfer ownership of the policy to the buyer. The buyer will have to pay any additional amount/premium as the case is. The transfer will be completed once the documents are evaluated. The buyer should ensure that his/her name is mentioned in the policy in order for it to be effective. The seller should remember to avail the No-Claim Bonus associated with the policy. This can help him/her get a better deal on the premium amount in the future.